Whether you’re taking part in Veganuary, want to make a batch of tasty vegan cupcakes for a vegan friend or relative, or are simply intrigued by egg free and vegan cake recipes, then these easy to make vegan cupcakes, flavoured with the classic combination of chocolate and cherry, are a must try. 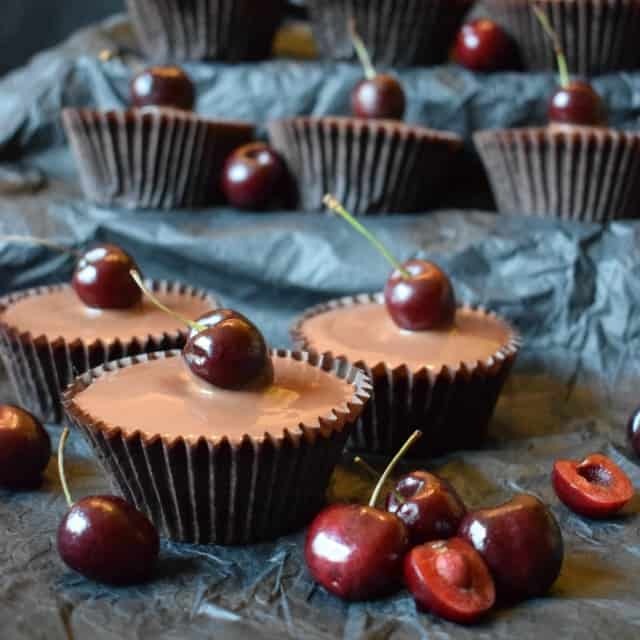 They are super light and moist, and are topped with a vegan chocolate ganache and a fresh cherry! Being quite a traditional home baker eggs feature regularly in my bakes. Whether its a simple Victoria sponge, fun cupcakes, a pastry bake or even a meringue, it’s rare for eggs not to feature in my ingredient list. Although Mr E & I have been vegetarian for more years than we care to remember, we seldom try out vegan recipes. It’s relatively straightforward to replace butter, milk and cream in a recipe – but eggs are a different matter. 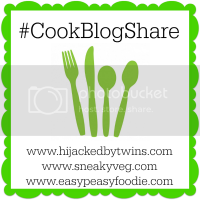 Imagine baking a Victoria Sponge or attempting a genoise cake without eggs! As a traditional baker the thought leaves me in a bit of a spin to be honest! My second foray in the world of vegan cakes was an utter disaster and went straight in the bin, after I’d nibbled a little of it! I’d attempted a light and moist Swiss Carrot Cake, replacing the separated eggs with apple sauce and whipped up aquafaba. It looked great going into the oven but during the bake the whole thing collapsed. The egg replacement clearly wasn’t robust or strong enough for the recipe. So in trying to understand why my previous vegan bakes had failed, it may be useful to look at the purpose of eggs in baking. As we know, eggs, once whipped, help to create volume and lightness in a bake (think of meringues and souffles in particular). However they also permanently bind together once heated (think of an omlette), helping to firm up the structure of the bake. With the help of James Morton’s ‘How Baking Works‘, here’s the science bit…..
Eggs are able to froth up and increase in volume due to the high protein content of the egg white. These proteins are called albumins, and when looked at under a microscope they are curled. 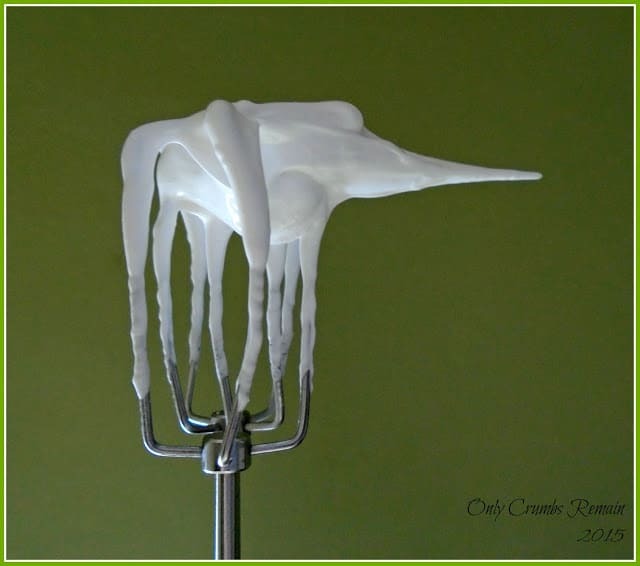 The whisking encourages the albumins to uncurl and stretch out, it also introduces air into the egg. This allows the albumins to turn into small bubbles which in turn gives cakes and meringues their lightness. Heat also allows the proteins to unfurl, allowing the batter mixture of a cake to rise and ‘leaven’. The proteins are more intact in fresher egg whites rather than those which are a little older, and so explains why recipes call for very fresh eggs to be used when making meringues and macarons, for instance. Egg yolks contain a protein called Lecithin. James Morton explains that this is a two-sided chemical structure. It allows one side to bind to fats whilst the other side binds to water. This has the effect of allowing mixtures to bind together, allowing them to be moist. He explains that cakes made without egg yolks and solely with egg whites have a tendency to be dry. Having carried out some reading around vegan egg replacers, in the hope that my third attempt at an egg free cake or cupcake would be successful, I learnt that there is a whole host of substitute ingredients available. I was already aware that aquafaba (the usually thrown away liquid surrounding tinned legumes, particularly chickpeas) is a great for vegan meringues and macarons, but my reading opened my eyes to the idea of using ingredients like banana, apple sauce, oils, white wine vinegar, baking powder and ground chia and flaxseeds in place of the humble egg. The trick, however, is to know which egg replacer to use for your chosen bake. Below are links to other sites which explain this simply and clearly and may be useful if you too are new to vegan baking. Food 52, in their post entitled How to make your own egg replacers, explains which vegan egg substitute to use for which type of bake. For instance, if you’re planning on making brownies or a custardy bake, Food 52 suggests using silken tofu. The Huggington Post shared, The best vegan egg replacement for baking. It’s basically a comparative bake post, similar to my Side-by-Side posts, in which the author whipped up 4 different batches of blueberry & lemon muffins. Each batch was made with a different egg replacer (chickpea, banana, flaxseed, acid base). A useful infograph of various egg alternatives can be found in this post entitled 12 egg replacements for baking and cooking. Wanting to make a some sort of vegan chocolate muffin or cupcake, the vegan egg replacer I selected was Flaxseeds. Now, just about every site I’ve visited regarding egg free baking advise to purchase the whole seed (this applies to chia seeds as well as flaxseeds) rather than the pre-ground seeds as the naturally occurring omega 3s in the product can soon become rancid and spoil. Food 52 (linked to above) also suggests that better results will be achieved when grinding the seeds as required. However, having already failed dismally at grinding chia seeds with a pestle and mortar it seemed fairly obvious that I’d have the same lack of success with the flaxseeds, and so purchased a packet of pre-ground flaxseeds for our vegan cupcake recipe. As it turns out my blogging pal Nico, who is a vegan and writes at YumSome, recently shared her thoughts on ground flaxseeds in her recipe for a vegan self-saucing chocolate pudding (check it out, it looks seriously delicious!) She explains that her packet of ground flaxseeds are 11 months old and have lost non of their ‘gloop’ making properties having been stored in the fridge! The point I’m trying to make here is this: if you have a suitable kitchen gadget to enable you to grind the seeds then, of course, buy the whole seeds and prepare them as required. However, if you want to try an egg free bake but don’t have a suitable gadget to grind the seeds don’t be put off from using the pre-ground products. Of course, the remainder of the ground seeds could be sprinkled over your porridge or cereal in a morning or even used in another egg free bake. If you choose to grind the seeds as required you’re going to need a suitable kitchen gadget to help you with the job. Spice and coffee grinders seem to be the go-to gadget for this task, although I have been reliably told that a stick blender also work well. Some sites list a pestle & mortar as being suitable, but having already tried this technique when grinding chia seeds I wouldn’t advocate it unless you have a significant amount of spare time! As with chia seeds, simply use 1 tablespoon of ground flaxseeds mixed with 3 tablespoons of warm water for every egg to be replaced. Once mixed with the warm water the mixture gradually turn gloopy and after about 10 minutes is ready to be used in your recipe. 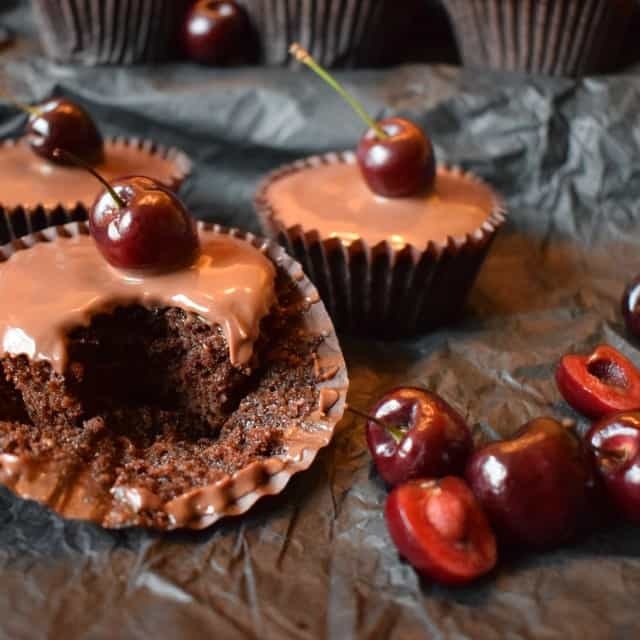 Vegan Chocolate and Cherry Cupcakes. And so, finally onto our egg free and vegan bake. Wondering if the flaxseeds would perhaps colour the sponge, we decided to make a batch of Chocolate and Cherry Cupcakes. Chocolate and Cherry is such a classic combination which is simply delicious. After all, the Black Forrest Gateau has recently undergone a resurgence of popularity for very good reasons. These vegan cupcakes (adapted from this chocolate cake recipe) are amazingly easy to make. There is no creaming or folding as you would with a traditional bake, like a Victoria sponge or genoise cake. In fact they’re made in much the same way as a muffin recipe. The dry ingredients are sifted into a bowl and the wet ingredients are added before everything is beaten together. It’s really that simple. The chocolate cupcakes rose beautifully during the bake and, although they sank slightly after coming out of the oven, the sponge was beautifully light and moist. 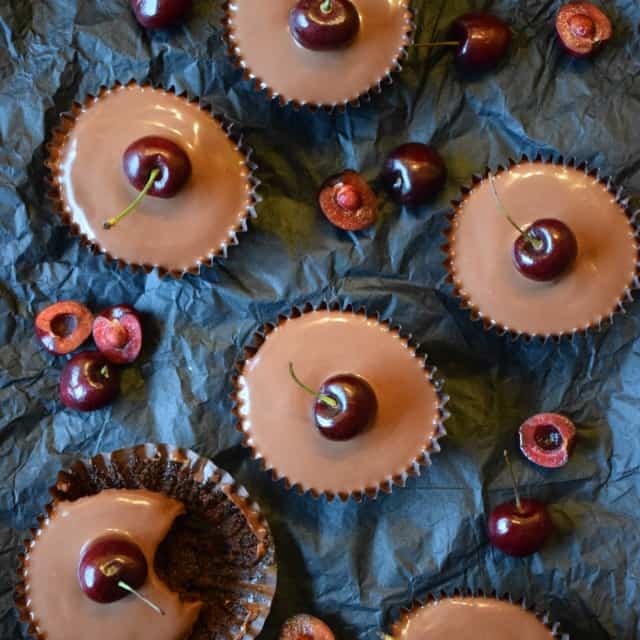 I had planned on filling these egg free Chocolate and Cherry Cupcakes with a hidden pocket of cherry jam, but the cake sponge itself was beautiful as it was and really didn’t warrant any further moisture being added to the bake. with a vegan chocolate ganache and a fresh cherry! 1. Prepare the vegan egg replacer. Place the ground flax seed into a bowl and add 6 tablespoons of warm water. Stir. Set aside for 10 minutes until it’s turned gloopy.2. Preheat the oven to 180c / 170 fan / gas mark 4. 3. Make the batter. Sieve the dry ingredients into a good sized mixing bowl. Add the flaxseed egg replacer mixture, vegetable oil and tamarind paste (if using). Beat together with either a wooden spoon or hand held electric beaters. Add the water and beat again until smooth.4. Divide between the muffin cases. Place the muffin cases into the hollows of a muffin tray. Divide the mixture equally between the 10 paper cases. Each paper case will be between half to two-thirds full.5. Bake. Place the muffin tray into the centre of the oven and bake for 18-20 minutes, or until a skewer inserted in the centre of the cakes comes out clean. You may need to rotate the tray after 15 minutes of baking. Once baked, remove the tray from the oven and place onto a cooling tray. 6. Make the vegan chocolate ganache. Break the chocolate up into small pieces and place into a dessert bowl (or similar). Pour the vegan cream alternative into a small pan. Set over a low heat. Allow the cream to heat through. Once on the cusp of simmering pour the cream over the chocolate. Stir thoroughly until the chocolate has completely melted and the ganache is rich and shiny in appearance. Set aside to cool. You may need to place it in the fridge for about 30 minutes to allow it to thicken up a little.7. Assemble. With a dessert spoon, divide the ganache mixture over the top of each cooled cupcake. Use the back of the spoon to spread the ganache to the edge of the cupcake. Top with a cherry. 8. Enjoy! a) The tamarind paste could be replaced with 1 tsp of vanilla extract or 1 tsp of expresso powder. b) Consider using a cocktail stick to hold the cherry insitu, however do remember to tell your guests of the cocktail stick and of course the cherry stone! Ooh, your photos look so good Angela, my mouth is watering. Cherry and chocolate is such a good combination. I really like the light texture of eggless cupcakes. I must say I don't bother with egg replacers when making vegan bakes, although I do usually add a little vinegar. I tried aquafaba once and it was a total disaster. 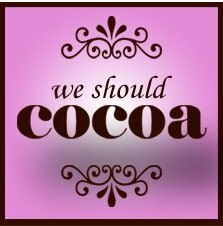 Thanks for sharing with We Should Cocoa. I've pinned to my vegan bakes board as well as the We Should Cocoa one. Aw thankyou Chocolette. It's amazing how light the cupcakes were without the egg, I was seriously surprised. I'm glad it's not just me that has strugged to use aquafaba in cakes, though I suspect i shall revisit it at some point. 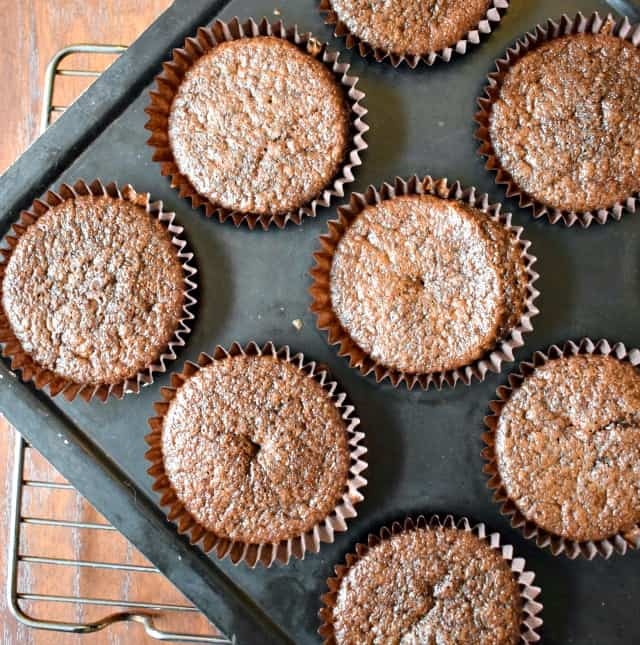 What gorgeous photos Angela, your vegan cakes look amazing and it is really interesting to read about egg replacers in vegan baking, I started a vegan bakes board on Pinterest and it is something I have been meaning to try. But when it comes to it grabbing eggs, butter, milk, sugar and flour is always so much easier so I haven't got round to it yet. 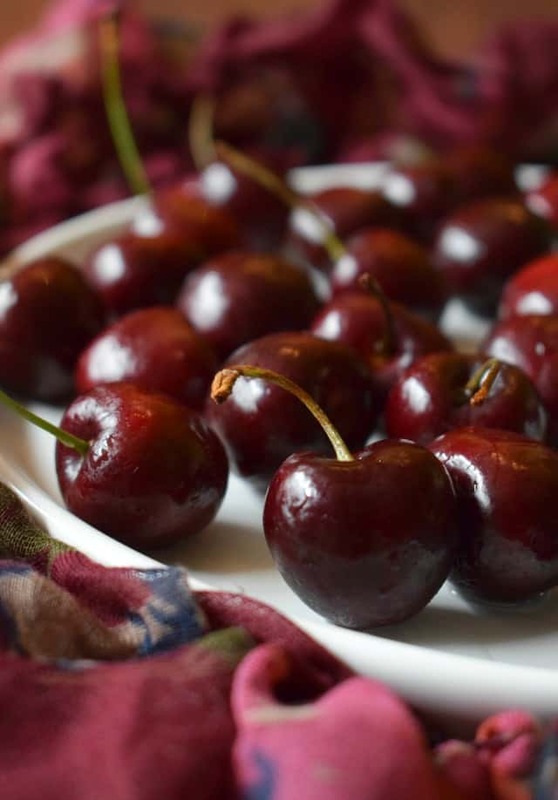 These look so pretty and moist, I adore cherries so this is a real winner for me. Thankyou, cherries are just lovely in a bake aren't they 🙂 I have to say they were beautifully soft and moist, and yet still aerated! Aw thankyou Sarah. I had no idea either, but I'd definitely recomend setting a couple of spoonfuls of your flaxseed aside and trying a vegan bake – it's amazing what they do in place of the eggs! Lordy lord. I saw these on your Instagram and they look to die for! Looooovvving your photography in the post also! So profesh! Awe thankyou Betty, I'm glad you like the look of them 🙂 The pictures are all down to our new camera – I have a lot to learn with it but even just on auto mode the pictures are far clearer than our old compact. These look beautiful! 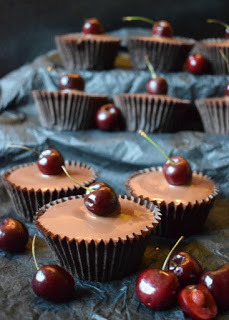 Chocolate and cherries go so well together and it sounds like you've learnt loads about vegan baking which is great too. This was a really interested read Angela. I've avoided making vegan cakes for the exact same reason that I cannot imagine baking one without eggs. However, your cakes look perfect so perhaps I'll have to give it a try. I was interested to see that you added tamarind paste to your cake mix. It would never have occurred to me to add it to a sweet dish like this. Aw thankyou Charlotte 🙂 It still seems 'bizarre' that such light cakes can be made without eggs. But something really enlightening. I'd definitely suggest visiting vegan cakes Charlotte, they certainly weren't obviously lacking anything at all. The sponge was beautifully soft and moist and I suspect they would keep really well (they didn't get the chance to last long around here having shared them with my folks – they were interested in them with them being free of sat fats!). I used the tamarind paste having seen it used in a Baked Bengal Curds recipe (I blogged about that a few wks ago). The origianl recipe for the curds had used the tamarind to macerate the fruits, so knowing that and having read online that the paste can successfully be used in sweet bakes I thought that the addition of the paste would help enhance the flavour of the cherries (which I'd initially planned as being a secret treat in the middle of the cupcake once baked.) Non the less, the tamarind certainlg didn't negatively affect the bake. I do the same thing as you, I avoid baking vegan dishes, especially for the traditional ones. But I would cook a lot of savoury vegan dishes. I should bake vegan more often, to learn new things about baking. It was really interesting to learn about all of the vegan alternatives we can use in our bakes as egg replacers Anca – I know I'll certainly be visiting vegan baking again. Angela these look gorgeous. As you know I'm interested in egg replacements too but haven't tried flaxseeds yet. Well done for persevering! Thank you Mandy, I must say I was very pleasantly surprised by how effective they were. Hahaha, I must admit i quite enjoyed visiting the 'darkside' Midgie 🙂 Ah, you'r full of information 🙂 I had no idea that whole seeds and even golden syrup would work too. Do the wholeseeds breakdown during the bake or are they noticeable during the eat? Thank you Jenny, to be honest I was intregued more than anything about how they would turn out and if there was anything obviously different. Happily, they turned out to be lovely and certainly not obviously egg-free or vegan. 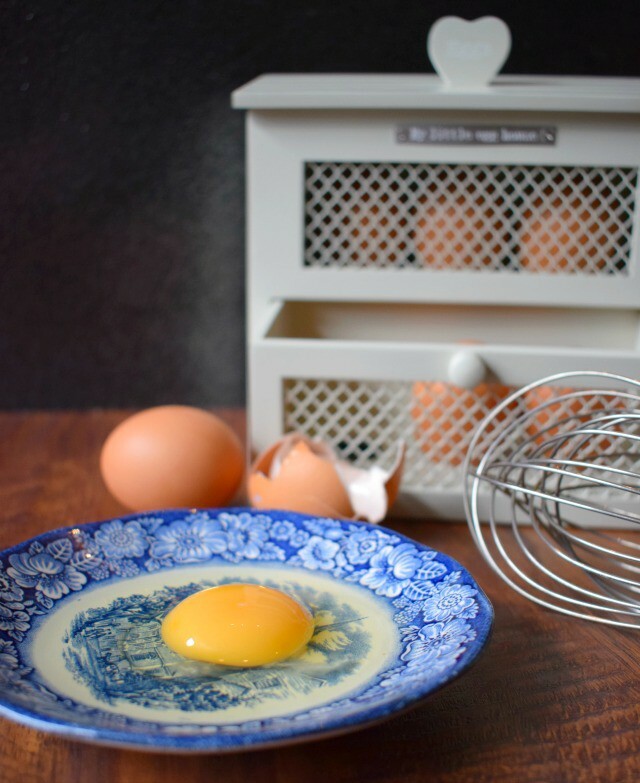 I think it's perhaps useful to have alternatives up our sleeves even as bakers who regularly use eggs for that instance when you 'need' to bake and there is only one egg available and no time to go to the shop to buy another dozen eggs!